Observation - Unidentified Lichens - Global. 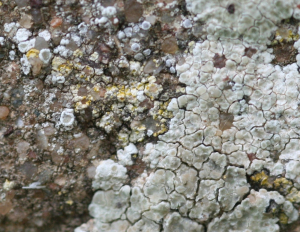 Description: I don't have any identification guides for lichens. Can anyone i.d the two species in this photograph please? I don't have any identification guides for lichens. Can anyone i.d the two species in this photograph please?